After gaining widespread recognition as the manufacturer of one of the best vacuum brands, Dyson turned its attention to making washing machines with superior cleaning power. The result was the double-drum Dyson washer, which came on the market in 2000. Although Dyson washing machines aren't available anymore, the technology they developed is important to the laundry industry. The Dyson washing machine was invented by Dyson engineers trying to improve the cleaning power of washing machines. During testing, the engineers found that traditional, single drum washing machines have trouble effectively getting the dirt out of clothes. 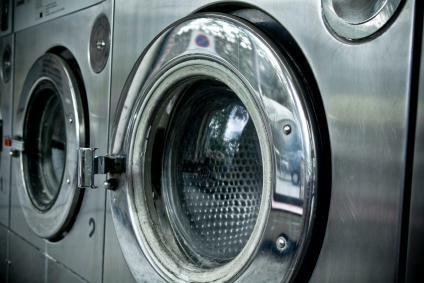 Single drum washing machines don't agitate the fabric enough to remove dirt quickly. In some tests, washing clothes by hand was more effective than using a single drum washing machine. These test results inspired the engineers to manufacture special equipment that mimicked the actions that a person's hands perform during hand washing. Dyson washing machines stand out because of their front-loading design and color choices. What set Dyson apart was the use of two drums, which allowed the machine to thoroughly wash clothes faster and handle large loads of laundry better. The front-loading design helps the two drum action. The two drums were designed to rotate in opposite directions, gently, and efficiently releasing dirt from clothing. The drums also included 5,000 perforations versus the 945 found in standard washing machines. The most well-known washing machine from this line was the Dyson CR01, recognizable by its colors. Machines were all silver, or silver with purple, yellow, or blue details. The double-layer door of the machine was made of the same heavy duty plastic that police use for riot gear. The door is designed to unhinge if it is stressed, which minimizes the risk of breaking. If you are moving, you'll be able to transport the Dyson CR01 with ease. A handle pops out from underneath the machine and instantly raises the unit onto small wheels. Once you've placed the washer where it needs to go, simply pop the handle back into the machine and the wheels disappear. The Dyson washing machine was factory tested to last for 20 years. It is a heavy duty piece of equipment that handles the daily wear and tear of washing clothes with ease. There are a few problems mentioned in customer reviews, but Dyson has a responsive customer service support line and prompt repairmen. Though the machine is no longer made, support and repair are available on Dyson washers. While Dyson no longer makes washing machines, their vacuums are one of the most respected brands on the market.